This recipe comes from our production accountant Sylvia, who learned it from her Nonna. Gotta love when your team brings goodies into the office! Boil whole, skin-on potatoes in salted water until tender. (Do not cut or peel, as you don’t want them too saturated with water.) Once done, drain and peel the skin off each potato. Best done while still hot. I hold with a fork and use a knife to peel back the skin. While potatoes are still warm, rice the potatoes into a large bowl. Let cool. Meanwhile: Prepare plums by removing the pits. Try to do this with a small a slit as possible, just slightly under ½ the length of the prune, following the natural line in the plum. They should still look somewhat intact. Set aside. On a floured surface, dump the cooled riced potatoes, making a well in the center. Add the eggs and oil into the well. Sprinkle 1 cup of flour overt the mixture and using your hands, start kneading together. It will be messy to start, and the dough will be sticky. Gradually adding flour, quanta basta, until the dough is no longer sticky and has a nice smooth texture. Do not over knead as you want the dough to be light and fluffy. Cut dough in ½ and using your palms roll each section into 3 inch diameter rolls. Set a large deep pot of salted water, approx ½ full, to a soft rolling boil. I like doing this next step one plum at a time. This way I get a better feel for how much dough I need to cover each plum and I get better as I go along. 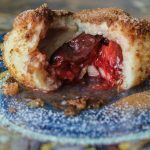 From one of the 3” rolls, cut off a 2”-3” section, and on a floured surface, using your finger tips, flatten into ½ inch thick circles wide enough to wrap around a plum. 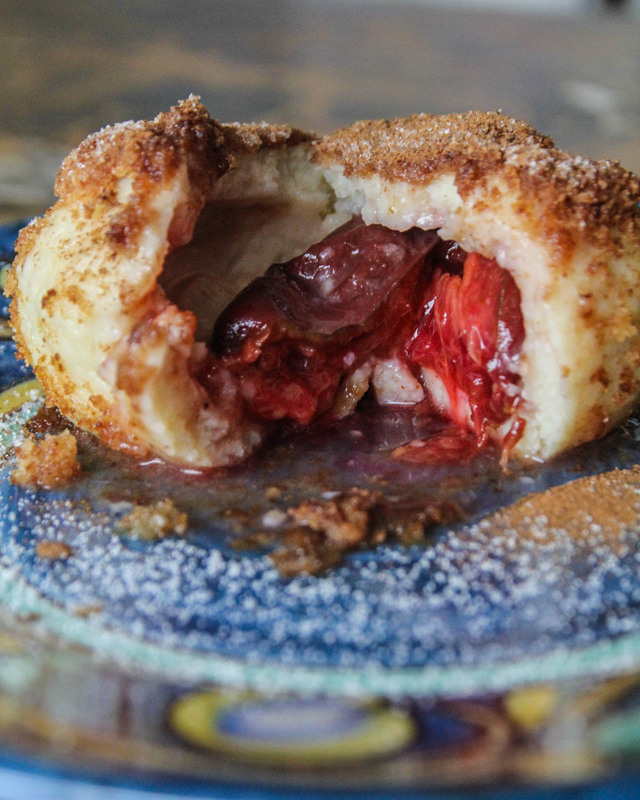 Fill the center of a pitted plume with sugar, close plum and place in center of circle. Wrap the dough, without tearing, completely around the plum, pinch closed, removing any excess dough at the same time. Use excess for next plum. You should have a gnocchi ball slightly smaller than a tennis ball. Place gnocchi balls on a floured dish. Once you have made about half, using a large spoon, gently drop the gnocchi into the boiling water, 1 layer only, just enough to cover the bottom. They should be well covered with water approx. 5”. Go back to wrapping your plums, checking your pot, stirring gently to prevent sticking. Once the gnocchi float to the surface, continue to cook for another 5 minutes. Remove with a slotted spoon and place on a dish. Repeat until you have boiled all gnocchi balls. Meanwhile, in a large frying pan, melt ½ cup butter and approx. 1/2 cup bread crumbs until golden brown. Remove from heat and roll each gnocchi in the bread crumb mixture until coated. Place on a platter and sprinkle with remaining crumbs. Continue until all have been coated preparing more crumb mixture as required. Serve warm, with sugar and cinnamon sprinkled on top.